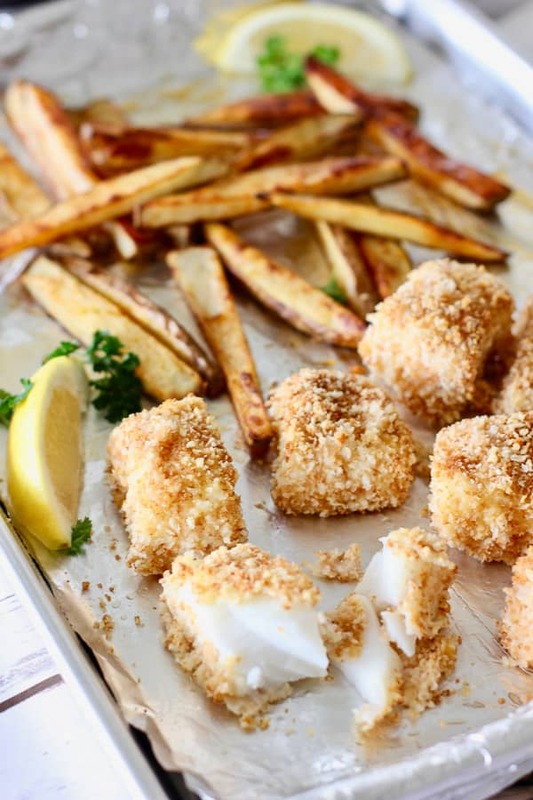 Fresh Crispy Oven Baked Fish and Chips all baked on ONE SHEET PAN! No grease, no clean up, no clogged arteries. Feeling skinny! Check out our secret weapon for perfect oven baked fish! 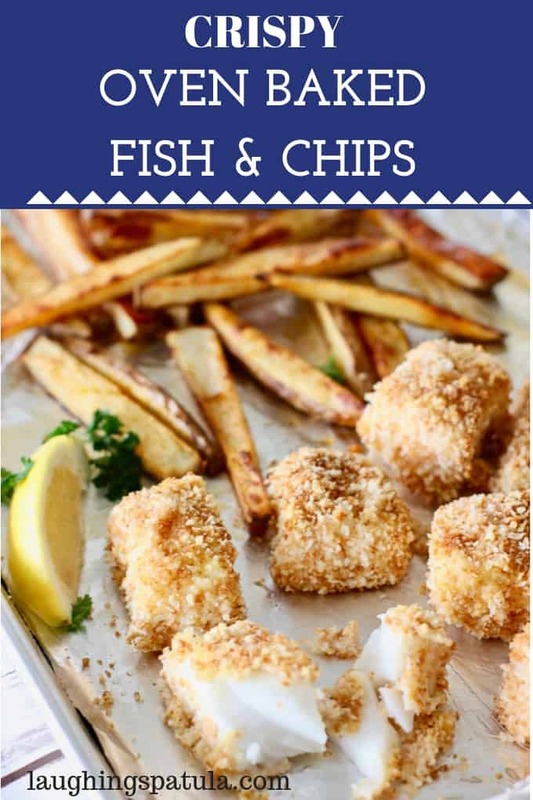 The trick to making Crispy Oven Baked Fish and Chips! Whats that secret? Pre browned panko crumbs! 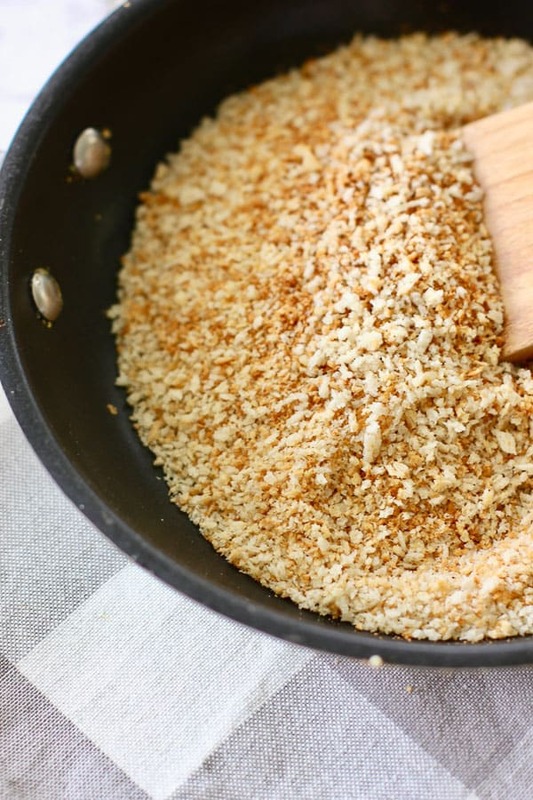 Simply dump those plain old panko crumbs in a hot skillet and 5 minutes later they are golden. This gives them a good head start so you don’t over cook your fish trying to get the crumbs brown. Here is my second installment on the beauty of pre-browned Panko crumbs! I posted Panko Crusted Salmon and I am still in awe over what I can do with these things! We used ONE SHEET PAN for the fish and the fries! We gave the fries a 15 minute head start and left room on the sheet pan for the fish. We used a really hot oven. 450 degrees to make sure those fries get good and crispy. While the fries are cooking set up your dredging station with 3 bowls (paper plates work great for the dry ingredients for a quick clean up). Dip in FLOUR, EGG, PANKO. Set onto a nonstick surface like parchment or acrylic cutting board. By the time your done, your fries will be half way there! 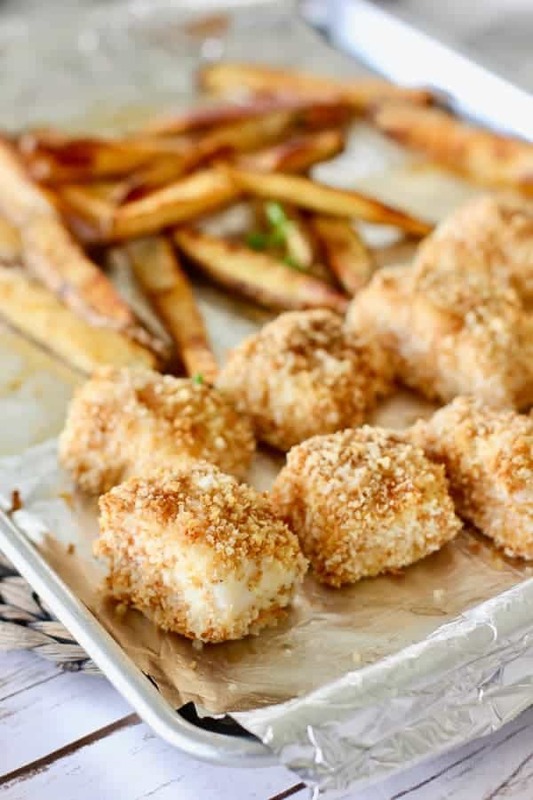 15 minutes later pull that hot sheet pan from the oven and add the panko crusted fish. Back in the oven for a quick 12-15 minutes ( depending on the thickness of your fish) and ding fries and fish are done! We serve this with out Greek Yogurt Honey Mustard Dipping Sauce! More skinniness! yay! To easy, fast, fresh and healthy dinners! Crispy oven baked (not fried) fish and chips! 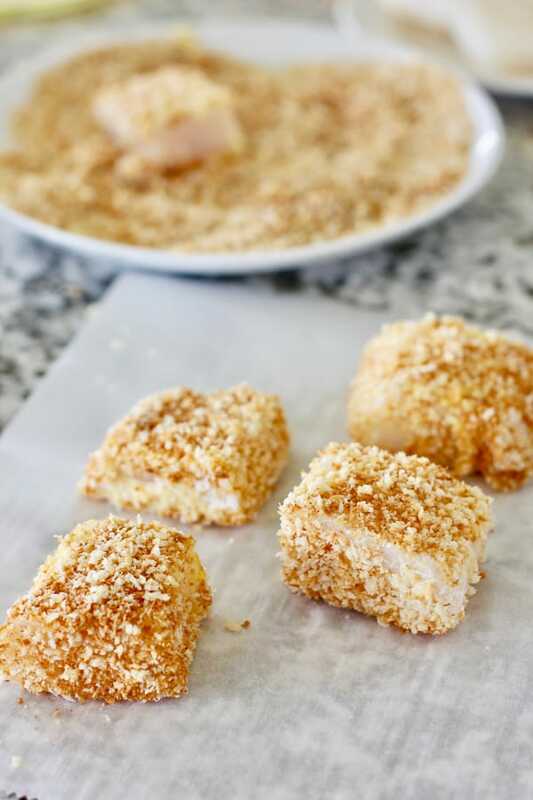 The panko crumbs are lightly toasted before dredging to give them a head start and assure your fish is super brown and crispy every time! The fresh fries are cooked on the same pan as the fish...easy clean up! Wash potatoes and pat dry. Cut into french fry shapes and PAT DRY AGAIN. Dryer the potato, better the fry. Cover large baking sheet with foil or parchment. Add one tablespoon vegetable oil to HALF of the sheet pan. 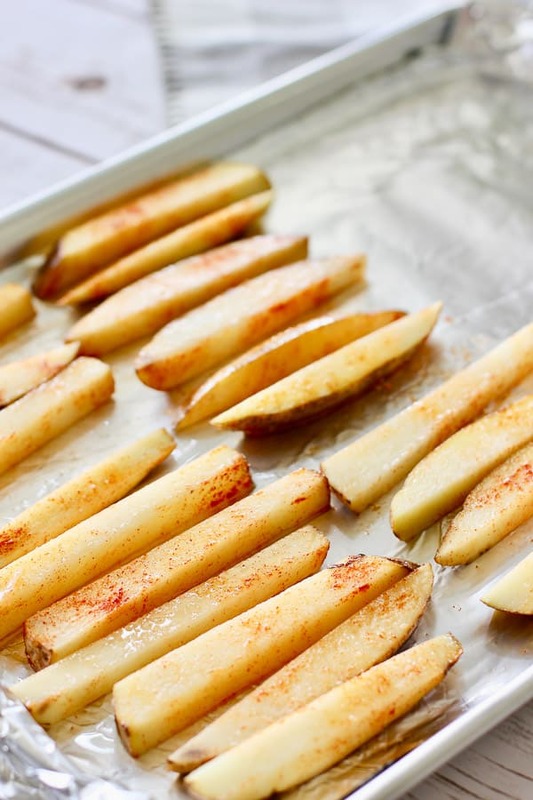 Toss the dry fries in 1 tablespoon vegetable oil, salt, pepper and paprika. Place in oven and set timer for 15 minutes. While fries are baking: Slice fish into stripes or squares, keeping them the same size to ensure even baking. Pat dry, season with salt and pepper. 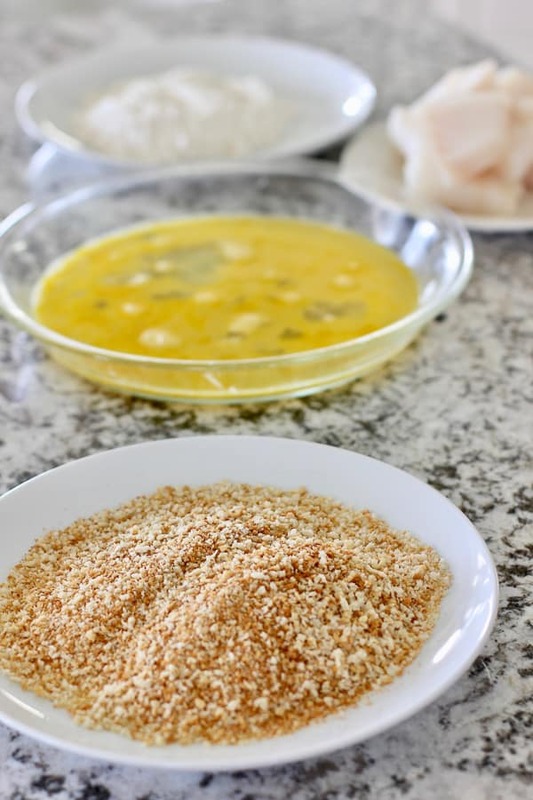 Using three separate bowls, add flour to one, eggs in second and browned crumbs into the third. Remove hot sheet pan carefully from oven. Spray empty half with non stick spray and add fish. Bake for an additional 15 minutes or until fish is firm to touch and cooked through. Serve with our Honey Mustard Greek Yogurt Dipping Sauce or your favorite tarter sauce. Thanks for posting. 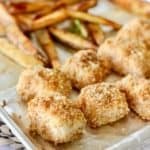 I was looking for a healthy “fried” fish recipe and this one delivered. I love this recipe so typical of UK, the probe once you travel to London and this delicious. Do you think I could make these ahead if time (2-3 hours) and Coke later? Hi Kathy – to be honest, I am just not sure I could recommend it. 1.) I have never tried it and 2.) I think the coating would get mushy. Maybe you could make the dredging bowls in advance so you could bang it out quickly? If you try it, let me know how it works! 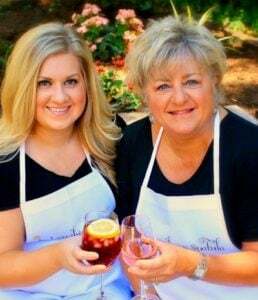 Sorry I couldn’t be more help. AWESOME! My kids loved it!!!! I used seasoned panko bread crumbs! New family favorite! Thank you!